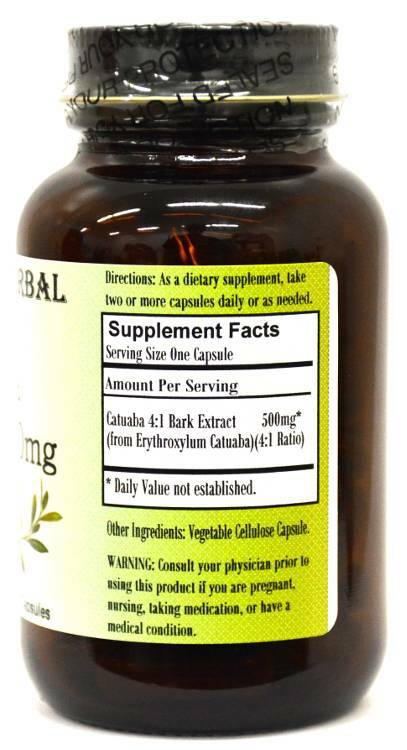 Barlowe's Herbal Elixirs now offers a 4:1 Catuaba Extract. Catuaba (Erythroxylum Catuaba) has a long history of use in herbal medicine as a libido booster. In Brazil there is a popular saying, "Until a father reaches 60, the son is his; after that, the son is Catuaba's!" Bottled in Glass! No Stearates! No Fillers! No Junk! 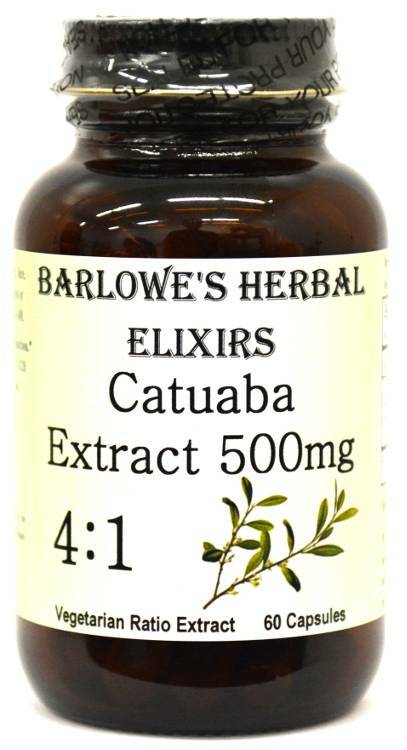 Barlowe's Herbal Elixirs now offers a 4:1 Catuaba Extract. 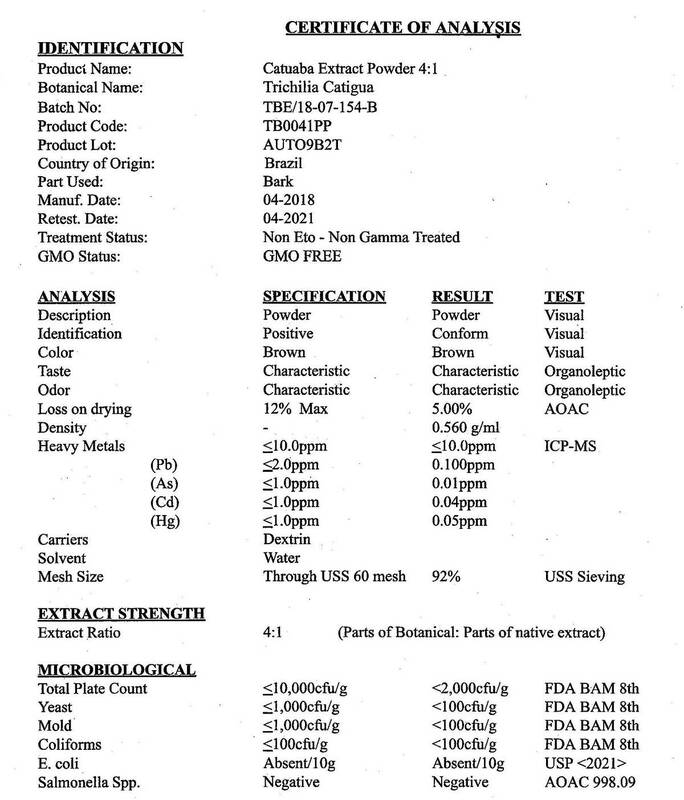 The Catuaba Certificate of Analysis (COA) of this particular batch is shown above. Catuaba (Erythroxylum Catuaba) has a long history of use in herbal medicine to enhance libido. Numerous songs have been written in South America praising the wonders and abilities of Catuaba. In Brazil there is a popular saying, "Until a father reaches 60, the son is his; after that, the son is Catuaba's!" Bottled in Glass! No Stearates! No Fillers! No Junk! In Brazilian herbal medicine, Catuaba is considered a central nervous system stimulant with libido boosting properties. It is generally prescribed for lack of desire in both men and women, agitation, nervousness, nerve pain, and poor memory. In Brazil, Catuaba is widely sold in a variety of products to enhance function for both men and women, generally in combination with the herb Muira Puama (also available in potent extract form from Barlowe's Herbal Elixirs). There is no evidence of bad side-effects. In 1992, a Japanese study showed that Catuaba had potential anti-bacterial activity. It also helps dilate and strengthen the arteries - improving circulation, and prevents inflammation. Directions For Use: Take two or more capsules daily on empty stomach and/or one to two hours prior to activity. For some people, dosage may need to be increased as results and usage amounts vary based on body type and weight. Some people may require a large dosage.